ABSTRACT. Patients undergoing autologous hematopoietic stem cell transplantation (autoHCT) are at increased risk for ... pital, Dana-Farber Cancer Institute, Children's Hos- pital, and ..... antigen-specific antibody responses by expanding the. Receive free email-alerts when new articles cite this article. Sign up at: .... Molecular mass and purity were ... IgG anti-CRM and anticapsular Ab responses were. 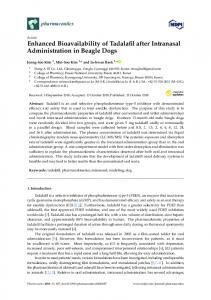 individuals (Wigton et al. 2015), and in studies looking specifically at responses to positive social stimuli in healthy individuals (Domes et al. 2010; Rilling et al. GE, genomic equivalent; ICS, intracellular cytokine staining; LCMV, lymphocytic choriomeningitis virus; NS, nonstructural; PALS, periarteriolar lymphoid sheath;. Infected Patients. Jong Hun Kim*, George Psevdos Jrâ ,â¡, Vanessa Groceâ¡, and Victoria Sharpâ¡ ... Correspondence to: George Psevdos Jr ..... Moir S, Fauci AS. Immunoglobulin M (IgM) monoclonal antibodies to an epitope shared by mouse ... Beginning with day 1 of treatment, the ... body treatments as described above. Passive antibody immunoprophylaxis is one method used to protect patients against ... the common feature in the successful use of topically applied ... MATERIALS AND METHODS ... A variety of MAb preparations were used for these studies. Passive antibody immunoprophylaxis is one method used to protect patients against ... passive antibody prophylaxis. ... Beginning with day 1 of treatment, the. FIG. 1. Structures of pIL2PA and pGMPA. amino acids, and 0.075% CSM-tryptophan, plus 1.5% agar for SEM plates) to stationary phase in an incubator shaker at 32°C and 175 rpm. The yeast was centrifuged at 5,000 3 g, resuspended in 80% SEM plus 20% glycerol, aliquoted into 1-ml tubes, and frozen at 270°C. Plasmid construction. The YEpFLAG-1 expression vector (Kodak Scientific Imaging Systems, New Haven, Conn.), used for cloning and expression of the proteins, contains origin of replication in E. coli, gene for ampicillin resistance in E. coli, 2mm DNA for replication in S. cerevisiae, tryptophan marker for selection in yeast, regulated promoter, and a-factor sequence for leader peptide, providing secretion from yeast cells. To construct the IL-2- and GM-CSF-containing plasmids, the following primer pairs with KpnI and SmaI restriction sites and specific for IL-2 and GM-CSF genes were used in the PCR: 59ggggtacctttggataaaagagcacctacttcaagttct39-59gac cccgggaccaccaccagttagtgttgagatgat39 and 59ggggtacctttggataaaagagctccgacgcgta gcccg39-59gaccccgggaccaccacctttttggactggttttttgc39, respectively. Plasmids carrying cDNA for human IL-2 (provided by Howard A. Young, Laboratory of Experimental Immunology, NCI-FCRDC) and murine GM-CSF (R&D Systems Europe Ltd.) were used as templates. PCR products were digested with restriction endonucleases KpnI and SmaI and ligated to the appropriate sites in YEpFLAG1. A few codons of the a-factor sequence (downstream of the KpnI site in YEpFLAG1) were eliminated by KpnI/SmaI cleavage of YEpFLAG1. They were restored by inclusion into 59 primers. 39 Primers contained three glycine codons for generation of a polyglycine linker between fused proteins. The resulting plasmids were named pYIL2 and pYGM, respectively. Genomic DNA from S. pneumoniae Rx1 was used as template in PCR with a primer pair containing SmaI and BamHI sites and specific to pspA gene. The 59-primer contains three glycine codons, as part of the linker between fusion protein subunits (59gtccccgggggtggtcccgtagccagtcagtctaaa39). The 39 primer contains translation stop codon downstream of six histidine codons (59gacggatcctta gtggtggtggtggtggtgtggagtttctggagctggagc39). The six histidine codons generate a His tail at the C terminus of the protein molecule for purification purposes. The PCR product was digested with restriction endonucleases SmaI and BamHI and cloned between the appropriate sites of pYIL2 and pYGM. The new plasmids, called pIL2PA and pGMPA, contain an a-factor sequence followed by full coding regions for IL-2 and GM-CSF, respectively, glycine linker codons, truncated gene for PspA (coding for amino acid residues 4 through 299 of mature PspA), and six histidine codons at the end upstream of the translation stop codon (Fig. 1). To construct a plasmid expressing only truncated PspA, the KpnI-SmaI fragment of pIL2PA was replaced by a synthetic linker with a KpnI cohesive end on the 59 termini, a blunt SmaI end on the 39 termini, and the codons for a-factor, removed by KpnI-SmaI cleavage of pIL2PA in between. This plasmid was named pPAF1. Yeast electroporation. A 100-ml culture of S. cerevisiae BJ3505 was grown in YPD medium (1% yeast extract, 2% peptone, 2% dextrose) until the optical density at 600 nm (OD600) was 1.3 to 1.5. The yeast was centrifuged at 2,000 rpm, the supernatant was removed, and the yeast was resuspended in 25 ml of sterile ice-cold 1 M sorbitol. After this wash step was performed three additional times, the yeast was centrifuged and as much sorbitol as possible was removed from the pellet. The yeast was vortexed, and 40 ml of the cells was transferred to an ice-cooled 0.2-cm electroporation cuvette. Then 2.5 ml of sheared salmon sperm DNA and 100 ng of plasmid DNA in a volume of 2.5 ml were mixed with the yeast, and the mixture was kept on ice for 30 min before electroporation. Cells were electroporated in a gene pulser (Bio-Rad) set at 1.5 kV, 200 V, and 25 mF. Immediately after electroporation, 0.4 ml of cold 1 M sorbitol was added to the cuvette. Transformed clones were selected by plating the cells onto SEM plates. Protein production and purification. Starter cultures of transformed yeast were prepared from frozen aliquots that were thawed and grown to saturation in SEM in an incubator shaker at 30°C and 175 rpm. Fifty milliliters of starter culture was added to 1 liter of YPHSF expression medium (1% dextrose, 3% glycerol, 1% yeast extract, 8% peptone, 20 mM CaCl2) and incubated for 72 h.
FIG. 2. Coomassie blue-stained SDS–4 to 20% polyacrylamide gel (A) and Western blot (B) of Ni-NTA-purified proteins. Filtered yeast supernatants containing His-tailed fusion proteins were concentrated, dialyzed, and purified by Ni-NTA affinity chromatography; 5-ml samples of purified proteins and a molecular mass marker (MWM) standard were size fractionated on an SDS–4 to 20% denaturing polyacrylamide gel. Membranes were probed with an MAb against either IL-2 or GM-CSF. FIG. 3. Proliferation assay to measure cytokine activity of recombinant proteins. (A) 1:10 serial dilutions of Ni-NTA-purified proteins were added to CTEV IL-2-dependent cells at 5 3 104 cells/well with an rIL2 control at a starting concentration of 1,000 U/ml. (B) 32D6RZ GM-CSF-dependent cells at 5 3 104 cells/well were incubated for 48 h, then pulsed with 1 mCi of [3H]thymidine for 6 h, and harvested. a Groups of five DBA/2 mice were immunized i.n. with PspA–IL-2 (10 mg), PspA–GM-CSF (10 mg), or PspA (10 mg) on days 0, 7, and 14. Mice were bled 14, 28, and 44 days later, and anti-PspA titers were determined by ELISA. Results are from one of three representative experiments. ND, not done. amino-acid N-terminal fragment of PspA, PspA–IL-2, or PspA–GM-CSF. One hour after receiving serum from immunized mice, all mice were challenged intravenously with 1,700 CFU of strain WU2 in 0.2 ml. The lethal intravenous dose of WU2 in CBA/N mice is between 10 and 100 CFU. Deaths were monitored for a period of 21 days postchallenge. Strain WU2 was grown in 100 ml of THY medium until late log phase, adjusted to 3% glycerol, and frozen in 1-ml aliquots containing about 107 CFU/ml. CFU were predetermined by plating pneumococci from one of the thawed aliquots. For inoculation, a fresh aliquot was thawed and appropriately diluted (about 1,000-fold) for injection. The actual number of CFU injected was confirmed by plating. a Groups of five DBA/2 mice were immunized i.n. with PspA (37 mg) or different doses of PspA–GM-CSF on days 0, 7, and 14. Mice were bled 14 days later, and anti-PspA titers were determined by ELISA. a Groups of five mice were immunized with 10 mg of PspA, PspA–IL-2, or PspA–GM-CSF and boosted 14 days later. Titers reflect averages of individual serum titrations obtained 14 days after the boost. a Groups of five DBA/2 mice were immunized i.n. with PspA–IL-2 (5 mg), PspA–GM-CSF (5 mg), or PspA (5 mg) on days 0, 7, and 14. Another group of mice were immunized s.c. with PspA (5 mg) in alhydrogel on day 0 and boosted with PspA (5 mg) on day 14. Mice were bled 14, 28, and 44 days later, and anti-PspA titers were determined by ELISA. a Groups of five DBA/2 mice were immunized i.n. with PspA–IL-2 (5 mg), PspA–GM-CSF (5 mg), or PspA (5 mg) on days 0, 7, and 14. Mice were bled 14, 28, and 44 days later, and anti-PspA titers were determined by ELISA. b Mice were anesthetized with CO2. a Groups of five DBA/2 mice were immunized s.c. with PspA–IL-2 (5 mg), PspA–GM-CSF (10 mg), or PspA (10 mg) on days 0, 7, and 14. Mice were bled 14, 28, and 44 days later, and anti-PspA titers were determined by ELISA. Results are from one of three representative experiments. a Groups of five DBA/2 mice were immunized with PspA–IL-2 or PspA–GMCSF at 5, 0.5, or 0.05 mg/mouse. Mice were boosted on day 14 and bled 14 days later. Results represent arithmetic means of ELISA titers determined for individual sera. Results are from one of four representative experiments. FIG. 4. Effect of IL-2 on anti-Pn14 responses to PspA-Pn14. Groups of five DBA/2 mice were immunized s.c. with either PspA-Pn14 (5 mg) or PspA–IL-2– Pn14 (5 mg), boosted on day 14, and bled 14 days later. IgG antibody levels (micrograms/milliliter) to PspA in immune serum produced by immunization with PspA (s.c.), PspA-IL2 (s.c.), PspA (i.n. ), and PspA-GMCSF (i.n.) were ,0.3, 400, ,0.3, and 156, respectively. Levels for IgA were ,0.3, 8.5, ,0.3, and 14.5; levels for IgM were ,0.5, 2.7, ,0.5, and 2.6. b Sera were diluted in Ringer’s solution. c Calculated versus pooled PspA only for the same injection route by Fisher’s exact test; NA, not applicable; NS, not significant, P $ 0.05.
and IgG2a antibody titers, while the GM-CSF fusion stimulated predominantly IgG1 antibody, with extremely low levels of IgG2a. This result suggests that the GM-CSF fusion stimulated a predominant TH2-dominated response and the IL-2 fusion stimulated a response reflecting a TH1 component as well. This observation supports the idea that the cytokines were not merely functioning as carrier molecules for PspA independent of their cytokine activity. In other studies, we injected PspA into IL-2 receptor knockout mice and found that PspA in alhydrogel stimulated a significant anti-PspA response; PspAIL2 stimulated no detectable response (not shown). The data presented here are also the first to demonstrate that protein-cytokine fusions can stimulate enhanced systemic responses even when administered i.n. Under these conditions, the TH1-versus-TH2 profile of the response followed the same pattern as when the antigens were given s.c. While for i.n. immunizations 10 mg of antigen was placed on the nares, the fraction that was actually delivered to an immune responserelevant site is unknown. In an attempt to enhance intrapulmonary localization, we anesthetized mice, and we found no obvious difference in the antibody titers stimulated in anesthetized versus nonanesthetized mice. We were able to detect only extremely low levels of serum, or salivary IgA (not shown), suggesting either that this specific protein may be unable to stimulate IgA1 antigen-specific B cells or that the attached cytokines may not be the appropriate ones for stimulating a mucosal IgA response. We are attempting to determine whether the described IgA switch factor with transforming growth factor b might be a better fusion partner to induce this isotype. Immunizations by the i.n. route have been demonstrated by many groups to provide an effective mode of antigen delivery. In all of the published reports, however, antigens had to be administered either daily or in an adjuvanted form to be effective (6, 7, 8, 14, 24). Liposomes, proteasomes, CT, and E. coli labile toxin have all been used to enhance the magnitude of the antibody responses when antigens are given i.n. The use of adjuvants has the disadvantage that after they induce unwanted polyclonal Ig secretion, undesired inflammatory responses are unstable. The use of cytokines as the mucosal adjuvant provides the benefit that it is a physiologic immune modulator that is being targeted to an antigen-specific cell. The use of protein-cytokine fusions provides a way of inducing rapid immunity while being able to modulate the isotype being produced without diverting the immune response to producing antibody to the administered adjuvant. Thus, for example, when CT is used as the adjuvant for i.n. immunization, more than 50% of the antibody that is made has specificity for CT. Exactly how this may affect subsequent immunizations with CT is not yet known. Since cytokines are both immune system stimulatory and proinflammatory, we examined pathological specimens of pulmonary tissue from mice given three to four i.n. immunizations with protein-cytokine. No difference from control lung specimens was noted (not shown). Furthermore, since we were injecting the cytokines in an altered, potentially immunogenic presentation, we tested for the presence of anticytokine antibody. In an assay so sensitive that we could detect as little as 0.1 ng of anti-IL-2 antibody per ml, we detected no anti-IL-2 in mice given three to four injections of PspA–IL-2 even when administered in complete Freund adjuvant (not shown). Taken together, these data suggest that protective immunity can be induced to bacterial challenge by proteins fused to GM-CSF as well as IL-2 and that protection can be achieved even after i.n. immunizations. ACKNOWLEDGMENTS The first two authors contributed equally to this work. This work was supported by NIH grant 1RO1-A136588. We gratefully acknowledge the financial and scientific support of SmithKline Beecham, Rixensart, Belgium. We are particularly grateful to Jean Paul Prieels, SmithKline Beecham, for continuing support and sage advice. REFERENCES 1. Boraschi, D., L. Nencioni, L. Villa, S. Censini, P. Bossu `, P. Ghiara, R. Presentini, F. Perin, D. Frasca, G. Doria, G. Forni, T. Musso, M. Giovarelli, P. Ghezzi, R. Bertini, H. O. Besedovsky, A. Del Ray, J. D. Sipe, G. Antoni, S. Silvestri, and A. Tagliabue. 1988. In vivo stimulation and restoration of the immune response by the noninflammatory fragment 163-171 of human interleukin 1b. J. Exp. Med. 168:675–686. 2. Briles, D. E., J. D. King, M. A. Gray, L. S. McDaniel, E. Swiatlo, and K. A. Benton. 1996. PspA, a protection-eliciting pneumococcal protein: immunogenicity of isolated native PspA in mice. Vaccine 14:858–867. 3. Briles, D. E., R. C. Tart, H.-Y. Wu, B. A. Ralph, M. W. Russell, and L. S. McDaniel. 1996. 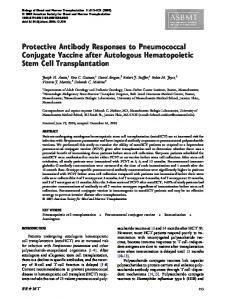 Systemic and mucosal protective immunity to pneumococcal surface protein A. N. Y. Acad. Sci. 797:118–126. 4. Chen, T. T., M.-H. Tao, and R. Levy. 1994. Idiotype-cytokine fusion proteins as cancer vaccines. Relative efficacy of IL-2, IL-4, and granulocyte-macrophage colony-stimulating factor. J. Immunol. 153:4775–4787. 5. Constant, S. L., and K. Bottomly. 1997. Induction of Th1 and Th2 CD41 T cell responses: the alternative approaches. Annu. Rev. Immunol. 15:297– 322. 6. Dale, J. B., and E. C. Chiang. 1995. Intranasal immunization with recombinant group A streptococcal M protein fragment fused to the B subunit of Escherichia coli labile toxin protects mice against systemic challenge infections. J. Infect. Dis. 171:1038–1041. 7. Debard, N., D. Buzoni-Gatel, and D. Bout. 1996. Intranasal immunization with SAG1 protein of Toxoplasma gondii in association with cholera toxin dramatically reduces development of cerebral cysts after oral infection. Infect. Immun. 64:2158–2166. 8. de Haan, A., J. F. Tomee, J. P. Huchshorn, and J. Wilschut. 1995. Liposomes as an immunoadjuvant system for stimulation of mucosal and systemic antibody responses against inactivated measles virus administered intranasally to mice. Vaccine 13:1320–1324. 9. Disis, M. L., H. Bernhard, F. M. Shiota, S. L. Hand, J. R. Grolow, E. S. Huseby, S. Gillis, and M. A. Cheever. 1996. Granulocyte-macrophage colony-stimulating factor: an effective adjuvant for protein and peptide-based vaccines. Blood 88:202–210. 10. Geissler, M., A. Gesien, K. Tokushige, and J. R. Wands. 1997. Enhancement of cellular and humoral immune responses to hepatitis C virus core protein using DNA-based vaccines augmented with cytokine-expressing plasmids. J. Immunol. 158:1231–1237. 11. Harvill, E. T., J. M. Fleming, and S. L. Morrison. 1996. In vivo properties of an IgG3-IL-2 fusion protein. A general strategy for immune potentiation. J. Immunol. 157:3165–3170. 12. Hazama, M., A. Mayumi-Aono, N. Asakawa, S. Kuroda, S. Hinuma, and Y. Fujisawa. 1993. Adjuvant-independent enhanced immune responses to recombinant herpes simplex virus type 1 glycoprotein D by fusion with biologically active interleukin-2. Vaccine 11:629–637. 13. Hinuma, S., M. Hazama, A. Mayumi, and Y. Fujisawa. 1991. A novel strategy for converting recombinant viral protein into high immunogenic antigen. FEBS Lett. 288:138–142. 14. Lowell, G. H., R. W. Kaminski, S. Grate, R. E. Hunt, C. Charney, S. Zimmer, and C. Colleton. 1996. Intranasal and intramuscular proteosome-staphylococcal enterotoxin B (SEB) toxoid vaccines: immunogenicity and efficacy against lethal SEB intoxication in mice. Infect. Immun. 64:1706–1713. 15. McDaniel, L. S., G. Scott, K. Widenhofer, J. M. Carroll, and D. E. Briles. 1986. Analysis of a surface protein of Streptococcus pneumoniae recognized by protective monoclonal antibodies. Microb. Pathog. 1:519–531. 16. McDaniel, L. S., B. A. Ralph, D. O. McDaniel, and D. E. Briles. 1994. Localization of protection-eliciting epitopes on PspA of Streptococcus pneumoniae between amino acid residues 192 and 260. Microb. Pathog. 17: 323–337. 17. McDaniel, L. S., J. S. Sheffield, P. Delucchi, and D. E. Briles. 1991. PspA, a surface protein of Streptococcus pneumoniae, is capable of eliciting protection against pneumococci of more than one capsular type. Infect. Immun. 59: 222–228. 18. Mond, J. J., A. Lees, and C. M. Snapper. 1995. T cell-independent antigens type 2. Annu. Rev. Immunol. 13:655–692. 19. Morrissey, P. J., L. Bressler, L. S. Park, A. Alpert, and S. Gillis. 1987. Granulocyte-macrophage colony-stimulating factor augments the primary antibody response by enhancing the function of antigen presenting cells. J. Immunol. 139:1113–1119. 20. Mosmann, T. R., and S. Sad. 1996. The expanding universe of T-cell subsets: Th1, Th2 and more. Immunol. Today 17:138–146. 21. Nencioni, L., L. Villa, A. Tagliabue, G. Antoni, R. Presentini, F. Perin, S.
Silvestri, and D. Boraschi. 1987. In vivo immunostimulating activity of the 163-171 peptide of human IL-1b. J. Immunol. 139:800–804. Rao, K. V. S., and A. R. Nayak. 1990. Enhanced immunogenicity of a sequence derived from hepatitis B virus surface antigen in a composite peptide that includes the immunostimulatory region from human interleukin 1. Proc. Natl. Acad. Sci. USA 87:5519–5522. Reed, S. G., D. L. Pihl, P. J. Conlon, and K. H. Grabstein. 1989. IL-1 as adjuvant: role of T cells in the augmentation of specific antibody production by recombinant human IL-1a. J. Immunol. 142:3129. Russell, M. W., Z. Moldoveanu, P. L. White, G. J. Sibert, J. Mestecky, and S. M. Michalek. 1996. Salivary, nasal, genital, and systemic antibody responses in monkeys immunized intranasally with a bacterial protein antigen and the cholera toxin B subunit. Infect. Immun. 64:1272–1283. Snapper, C. M., and W. E. Paul. 1987. Interferon-g and B cell stimulatory factor-1 reciprocally regulate Ig isotype production. Science 236:944–947. Snapper, C. M., M. A. Moorman, F. R. Rosas, M. R. Kehry, C. R. Maliszewski, and J. J. Mond. 1995. IL-3 and granulocyte-macrophage colony-stimulating factor strongly induce Ig secretion by sort-purified murine B cells activated through the membrane Ig, but not the CD40, signaling pathway. J. Immunol. 154:5842–5850. Tagliabue, A., and D. Boraschi. 1993. Cytokines as vaccine adjuvants: interleukin 1 and its synthetic peptide 163-171. Vaccine 11:594–595. INFECT. IMMUN. 28. Talkington, D. F., D. C. Voellinger, L. S. McDaniel, and D. E. Briles. 1992. 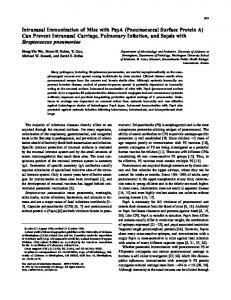 Analysis of pneumococcal PspA microheterogeneity in SDS polyacrylamide gels and the association of PspA with the cell membrane. Microb. Pathog. 13: 343–355. 29. Tao, M.-H., and R. Levy. 1993. Idiotype/granulocyte-macrophage colonystimulating factor fusion protein as a vaccine for B-cell lymphoma. Nature 362:755–758. 30. Weinberg, A., and T. C. Merigan. 1988. Recombinant interleukin 2 as an adjuvant for vaccine-induced protection: immunization of guinea pigs with herpes simplex virus subunit vaccines. J. Immunol. 140:294–299. 31. Xiang, Z., and H. C. J. Ertl. 1995. Manipulation of the immune response to a plasmid-encoded viral antigen by coinoculation with plasmids expressing cytokines. Immunity 2:129–135. 32. Yother, J., and D. E. Briles. 1992. Structural properties and evolutionary relationships of PspA, a surface protein of Streptococcus pneumoniae, as revealed by sequence analysis. J. Bacteriol. 174:601–609. 33. Yother, J., G. L. Handsome, and D. E. Briles. 1992. Truncated forms of PspA that are secreted from Streptococcus pneumoniae and their use in functional studies and cloning of the PspA gene. J. Bacteriol. 174:610–618. 34. Yother, J., and J. M. White. 1994. Novel surface attachment mechanism for the Streptococcus pneumoniae protein PspA. J. Bacteriol. 176:2976–2985. 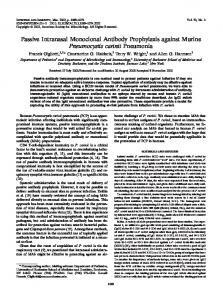 Report "Enhanced Protective Antibody Responses to PspA after Intranasal or"